Being the home of Mickey Mouse, it goes without saying that Orlando is one of the most popular holiday destinations for families travelling with kids. With plenty of sunshine and attractions as Sea World, Walt Disney World, and Universal Studios, Orlando is a children's playground and very often tops the list of places kids would most like to visit. Universal Studios is great for older kids too, as there are plenty of thrilling blockbuster-themed rides to enjoy, as well as games and other interactive activities. The 'littlies' can enjoy Fieval's playground, Woody Woodpeckers Nuthouse Coaster, and a 'Day in the Park with Barney', a live stage production where younger children can sing along to their favourite songs. Kids will also love a visit to Gatorland, a theme park and wildlife preserve that is nicknamed 'the Alligator Capital of the World', where thousands of crocodiles and alligators can be viewed from a boardwalk suspended above the marshy swamps below. Take the family to Water Mania or Wet 'n Wild to cool off in the hot Floridian sun, enjoy a historic and educational tour of the Kennedy Space Centre; spend the day hiking and picnicking in the Turkey Lake Park; check out what's happening round Lake Eola, or simply let the kids run around in the nearby playground while parents take a breather. 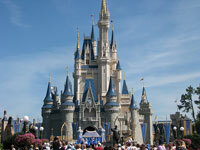 With all these options and more, kids will have a fabulous time on holiday in Orlando, but parents should note that during the spring and summer months the main tourist attractions and theme parks are heaving with visitors and a better time to visit Orlando may be during the slightly cooler months of autumn or winter.